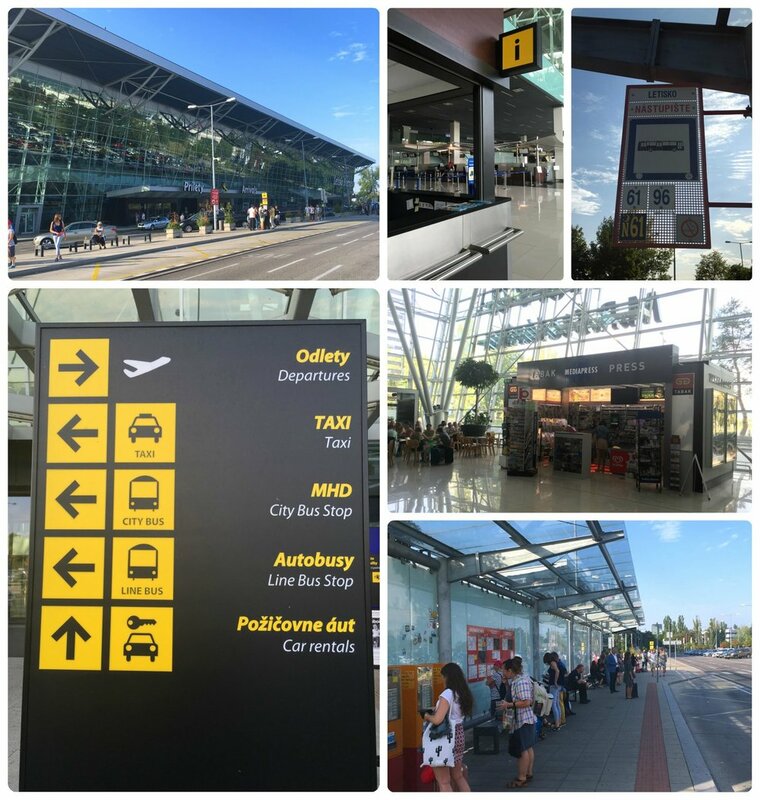 We arrived bright and early to the capital of Slovakia, at the Bratislava Airport (BTS) and were excited to drop our bags off and start our sightseeing! Since airports are usually located a bit out of city center, using public transportation is a great, reasonably priced option to get into town. Bratislava offers a great network of trams, trolleybuses, and buses, so the city was only a short trip away. Plus, we’d be able to use public transportation to make our getting around the city easier! However, there was one large downfall that we ran into like a brick wall rather quickly… our go-to tool, Google Maps Transit Directions, wasn't available in Bratislava. When we landed, we figured it must be because we were at the airport and the app didn’t have adequate information for the area. Unfortunately, even after we got into city center, we found there to be zero public transportation directions available in the Google Maps app. It was like being sent through a time warp, when we realized we needed to navigate with paper public transportation route maps! We’ve commented many times before on how difficult travelers of previous generations had it, without the luxury of digital maps, GPS, turn by turn directions, and smart phones. Well, now we were going to live it! So, fellow travelers be warned! Google doesn’t have adequate route, stop, and schedule information to provide public transit directions in Bratislava (as of the time of our visit). We hope that it’s updated soon, but in the meantime you’ll have to work around it (keep reading for a couple of workarounds, unfortunately not as elegant as Google Maps Transit Directions, but definitely better than nothing!). Clockwise (from the top): The Bratislava Airport, the information desk at the airport, the bus stop sign that shows the bus lines that stop at the airport (we took bus #61 into downtown), we purchased our bus tickets with a credit card from Mediapress in the airport terminal lobby, the center island where the buses stop and where you can purchase tickets with coins, the informational sign in front of the airport. MHD (Mestská hromadná doprava) manages Bratislava’s public transportation network, which is the largest public transport system in all of Slovakia. Public transportation dates back to the mid 1800s and if you’re interested in the history of the transportation system in Bratislava, be sure to read up on it! There are three different types of vehicles that are used for public transportation in Bratislava. Trams are used mainly in city center, especially on the most heavily used routes. You’ll find that trams are a faster transportation option, as they don't contend with traffic as much as buses and trolleybuses do. Many of the trams being used today are newer models, however you’ll find that there are still some older trams in circulation. If you’re interested in the specific models being used, be sure to checkout MHD's list of trams. There are nine different tramlines in Bratislava, which are numbered 1 through 9. In preparation of your visit, we recommend downloading the PDF Route Map for trams, as well as checking their schedules. There are 13 different trolleybus routes. If you’re interested in the specific models being used, be sure to checkout MHD's list of trolleybuses. We recommend downloading the PDF Route Map for trolleybuses, as well as checking their schedules. There are 67 regular bus routes, three regional buses (525, 801, 901), and 20 night routes (designated by an ‘N’ in front of the bus route number). If you’re interested in the specific models being used, be sure to checkout MHDs list of buses. Don’t forget to download the PDF Route Map for city routes, as well as checking their schedules. Bratislava public transportation is a network of buses, trams, and trolleybuses. There are three categories of tickets available, Single Journey Tickets, Day Tickets, and Prepaid Tickets. However, we’re not going to go into detail on Prepaid Tickets since they generally don’t apply to tourists and require a personal contactless chip card issued by the transport operator (or other accepted payment card) in order to purchase them. Also, if you’re traveling with baggage or an animal, you’ll need to purchase an additional reduced 15 minute ticket (€0.35), although in this case, unlike the standard reduced 15 minute ticket, it’s valid for three hours in all zones. If you’re transporting a bicycle, no additional ticket or charge is required. Reduced fares are available for children under 15 years old, students up to 25 years old, seniors above 62 years old, and handicapped people with ŤZP and ŤZP-S cards. Two signs we saw on buses that show the types of tickets available. The validity of a Single Journey Ticket is based on the time and zones it was purchased for. If you’re staying in Bratislava City (which consists of two zones), you don’t need to worry about purchasing a ticket with the correct zones, since all tickets are valid for at least two zones and work in all of Bratislava City. On the other hand, if you’re traveling outside of Bratislava City, then be sure to review the Zone information below. Unlike most cities, where you purchase your ticket based on distance, in Bratislava if you’re staying within city limits, you’ll want to base your Single Journey Ticket purchase on the time it’ll take to complete your journey. Single Journey Tickets can be purchased with 15 to 180 minutes of validity, and the cost is tied to the amount of time purchased. When figuring out how much time your journey will take, keep in mind that the time on the ticket doesn’t start when it’s purchased, instead it starts as soon as you board the vehicle and validate your ticket. Once you’ve validated your ticket, you may make as many transfers as needed, and you can transfer to a different type of vehicle without limitation, all with the end goal of completing your journey. Be sure to purchase plenty of time though, if you’re on the bus a minute longer than your ticket is valid, you risk being fined by an inspector. *Fares were valid during the time of our visit. Our Bratislava Single Journey Tickets. Look closely and you can see the validation stamp beneath the orange arrow, which indicates the direction to insert the ticket into the validating machine. Day Tickets are a great option for tourists, and can be purchased based on the zones needed and the number of hours needed (24, 72, or 168 hours). Also, don’t forget that Bratislava City is only made up of two zones, 100 and 101, so you don’t necessarily need to spend more on an unlimited zone ticket. Day tickets can be used for an unlimited number of rides without limitations on transfers or types of vehicles. Tickets can be purchased from ticket machines or sales points. In our experience, many, but not all transit stops had small yellow ticket machines where tickets could be purchased. Most of these machines only accept Euro coins (€0.05 to €2), however some do accept contactless debit cards. If you don’t have coins or a contactless credit card on you, you’ll need to exchange bank notes for coins or find a ticket sales point that accepts bank notes and/or credit cards. Tickets can’t be purchased on-board a public transportation vehicle, so don’t board without a ticket already in hand, because you’ll risk being fined. Public transportation ticket machines in Bratislava are located at many, but not all stops. All machines accept coins (no bank notes though), and some accept contactless debit cards. Most of the ticket validating machines are modern with digital screens. The older models don't have the digital screens, but use the same concept where you insert your ticket into the slot and the machine stamps your ticket. Tickets aren’t valid for travel when they’re purchased, they’re valid once you stamp them using the machine on-board. The validating machines are located at all the entrances to buses, trams, and trolleybuses and have a slot for you to insert your ticket. To insert it correctly, insert it face up with the arrow on the ticket pointing towards the machine. Be sure to insert it fully and wait a second. You’ll hear the machine stamp the ticket and then you can remove it. Always validate your ticket as soon as you board any vehicle. Failure to do so could lead to a fine, which is €50 on the spot, or €70 if paid later. We recommend downloading the PDF Zone Map if you’re traveling to regional areas. A couple examples of zone maps we found posted at bus and tram stops in Bratislava. Use Google Maps and zoom into a level that shows the nearest transit stop to your GPS marker on the map. For easy identification, the transit stations will be marked with a small blue bus or tram icon. Use a paper route map from MHD that’ll be posted at most transit stations. Alternatively, you could use a digital map from MHD’s website. When entering or exiting a vehicle, you’ll need to press the ‘Door’ button to open the doors. When exiting, the button is usually located on the pole in front of and to the side of the door. Trams stop at all stops on their predetermined route, however most of the buses and trolleybuses only stop at requested stops. This means, if you’re waiting for a bus or trolleybus to arrive, be sure to stay visible at the pickup point so the driver knows to stop. Alternatively, if you’re on the bus and want to disembark at the next stop, you’ll need to request your stop by pressing the button labeled ‘Stop’ that’s located on the poles and handles in newer vehicles, on the ceiling of older buses, or above the doors on older trolleybuses (labeled as ‘Znamenie vodičovi’ or ‘Zastávka na znamenie’). A few examples of bus and tram stops we came across in Bratislava. If you’re traveling between the airport and downtown you’ll probably want to take bus #61. At the airport, the stop for bus #61 can be found directly in front of the airport, in between the parking lot and the terminal building. If you’re back is to the airport, the stop for bus 61 will be on the island’s far right side. Depending on where you’re going into downtown you’ll probably only need a 15 minute ticket, however because of possible traffic and whatnot, the safest option would be to buy a 30 minute ticket. 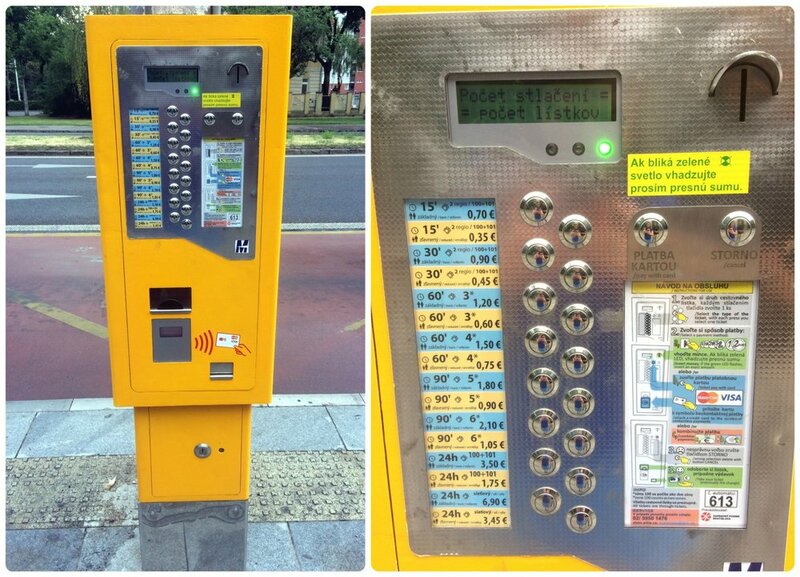 You can purchase tickets from the machine at the bus stop, but only Euro coins are accepted. Alternatively, you can use a credit card or bank notes if you purchase tickets from the Mediapress stand in the airport lobby. If you have any trouble or are in need of further information, we recommend going to the airport information desk. We also recommend checking for the most up to date airport information on the MHD website. To get into the heart of Old Town, take Tram #1. Accessibility information can be found on the MHD website. If you’re travelling with a dog or other pet, information can be found on the MHD website. If you need to get to or from the International bus station (Autobusová stanica), Main railway station (Hlavná stanica), or Railway station Bratislava-Petržalka (ŽST Petržalka) the MHD website outlines the best routes available. Finally, if you’re a facts and figures person, you’ll probably find it quite interesting to see the information MHD makes available on vehicles currently in service.